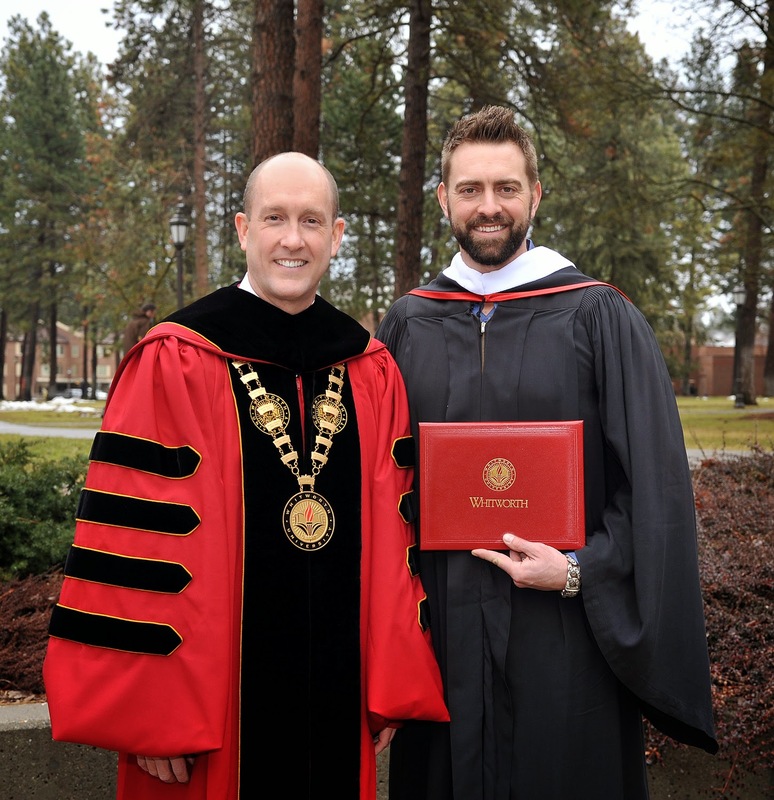 Affeldt’s degree, given honoris causa, was presented by Whitworth President Beck A. Taylor in recognition of Jeremy’s efforts which have been largely accomplished through his Spokane nonprofit organization Generation Alive, which Affeldt founded in 2005. Generation Alive’s primary focus is to provide opportunities to young people seeking to help others who are living in pain caused by extreme poverty or injustice. In 2014, Generation Alive partnered with Whitworth students, faculty, staff, alums, friends and community volunteers to raise $150,000 and pack 600,000 meals, which were then distributed by Second Harvest of the Inland Northwest to hungry people in Spokane, as well as to Nicaraguans in need. Generation Alive works closely in conjunction with other compassion-based non-profits including Not for Sale, C3 Missions International, Living Water International, One World Futbol Project and Second Harvest Food Bank. Affeldt, who is a graduate of Northwest Christian High School in Colbert, Wash., was drafted by the Kansas City Royals in the third round of the 1997 Major League Baseball draft. His debut with the Royals took place in 2002, and he has been in the majors ever since, pitching in both starting and relief roles. In 2006, Affeldt was traded to the Colorado Rockies, and he was a member of the Rockies team that went to the 2007 World Series. After one season with the Cincinnati Reds, he signed with the San Francisco Giants in 2009. Since then, the Giants have won three World Series, in all of which Affeldt made significant contributions. Most recently, Affeldt pitched two-and-a-third scoreless innings as the winning pitcher in the seventh game of the 2014 World Series.